Situated on Marco Island the Esplanade Marina opens up a nautical paradise that retains much of its natural splendor from when it was first discovered. Enjoy boating to tropical islands with sugar sand beaches, visit a dockside restaurant letting the tropical breeze sweep you away or relax and take in a magical sunset while watching the abundant wildlife play in a pristine environment. For those who love boating, the Esplanade Marina offers the southwest Florida boating lifestyle in a first class facility. Experience wild dolphins jumping in your boat's wake, manatees grazing next to you, the never before seen by human eyes shell you found on a hidden island, the big fish you caught right in the Marco River, the picnic lunch you enjoyed at Keewaydin Island, the dockside restaurant you ate at, the beautiful real estate you viewed from the water and that long nap you took in the boat gently rocking you to sleep while the kids played on the sand and swam in the water. An average day on the water can start out with a stop at Keewaydin Island for shelling and swimming, a ride up to Naples or the Isles of Capri for lunch right on the water at a number of fine restaurants or a cook-out / picnic on an exclusive island. Afterwards, tour some of the nicest and exclusive real estate on Marco Island, in Port Royal, or Isles of Capri. After lunch has had a moment to digest during your beautiful tour, stop at a different island for some more beach fun or that relaxing afternoon nap falling asleep to the sounds of the Gulf of Mexico. 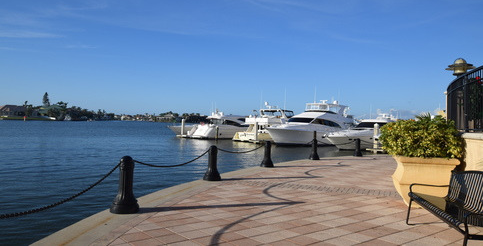 Finish your day off by returning to the Esplanade Marina down the beautiful Marco River through Collier Bay. Then spend the rest of your day or evening by shopping at The Esplanade Shoppes and dining at one of the great restaurants, then finish the day with a wonderful dessert from the Cold Stone Creamery. It is your day on the water, your schedule, your pace. This is your moment....southwest Florida boating lifestyle at your own private marina. From Marco River turn east by marker 12-red entering Collier Bay. Keep to the left, on the south/east end turn left by marker 11-green. Enter Smokehouse Bay from the east/northeast. Esplanade is located at the east side of the bay. The Geo coordinates are 25° 57.286 N, 081° 43.775 W.